Latin percussionist and band leader Ray Barreto was born on April 29, 1929 in Brooklyn, New York of Puerto Rican decent.. For almost 4 decades Ray was a leading exponent in Latin Jazz and Salsa. A founding member of the Fania All Stars Barreto recorded almost 2 dozen albums with the Fania label. He was an inovator in fusing Afro-Caribbean rhythms with Jazz improvisation techniques. His stardom was cemented with his first recording of "Manteca" a song originally recorded by Dizzy Guilespie with Chon Pozo on percussion. From that first recording on the Red Garland label Ray Barreto would become on of the most prolific Latin percussionist in Jazz. He goes all the way back to the BeBop jams in Harlem in the late 1940's. Ray Barreto died on February 17, 2006 at Hackensack University Medical Center in Hackensack, N.J. at 5 AM. after suffering from heart disease. This Fan Page has links to photographs and MPG Salsa Video Clips of Ray Barreto. 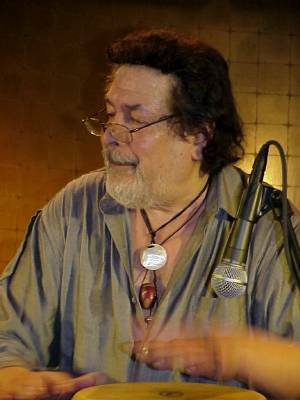 Ray Barreto is a Puerto Rican conga player that was part of the original Fania All Stars. He is a band leader an plays Latin Jazz and Salsa. Here we have photographs of Ray playing at Madison Square Garden and LQ nigtclub in New York City.